I love Tonic's Kensington Handbag die set... but not for the reason you'd think! Yes, it makes absolutely darling little gift bags but what really struck me was the beautiful lacework die that is included. 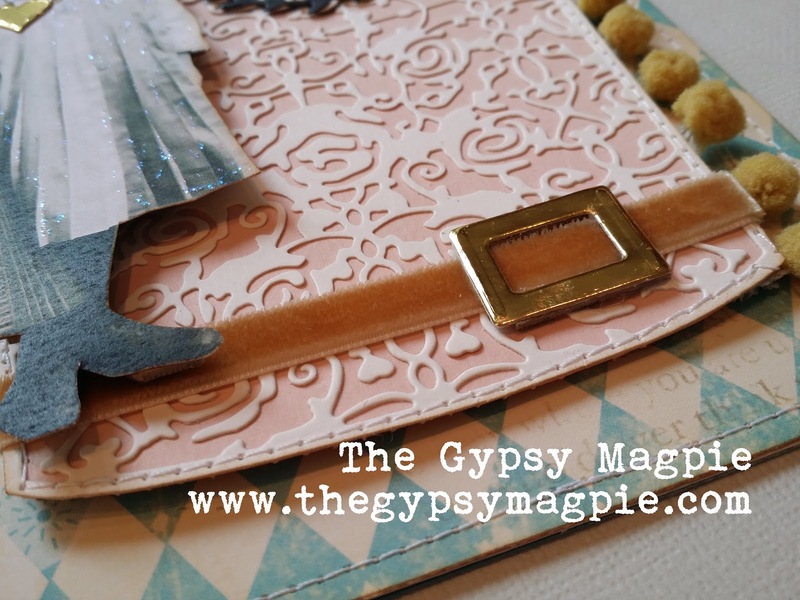 Instead of using it the way it was originally intended (to make a handbag) I decided to 'deconstruct' the set into individual pieces to make a card. 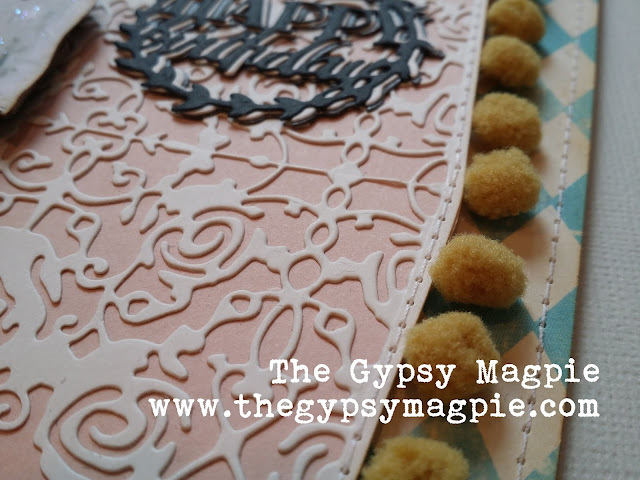 To make the lacework panel, I used the die that would have been for the handbag's top flap to add interest to the top and bottom of the side piece die. The resulting shape was interesting and the pom pom trim just ended up accentuating that shape. Any time I can machine stitch on my work it makes me happy! 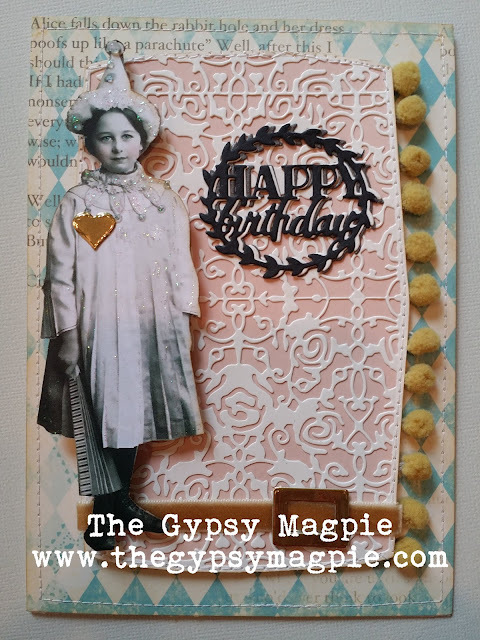 Since I like to work mainly with vintage/vintage-inspired images, the delicate background was perfect for this little birthday girl. Gold mirror card stock made a sturdy buckle to embellish the strip of golden velvet. 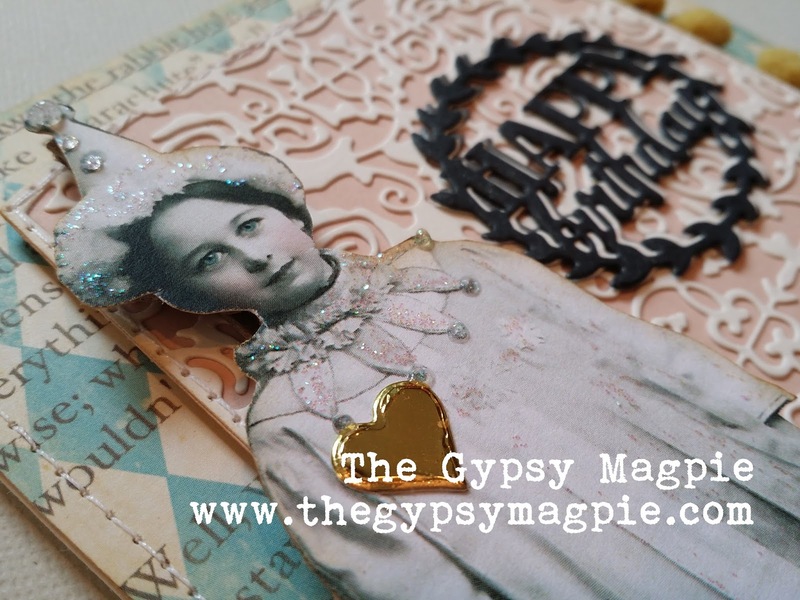 The tiniest scrap of gold was used to cut the heart and add as the perfect accent for her party best. One last bit of decoration- Nuvo Crystal Drops made perfect little glittery 'pom poms' on the hat and pointed collar. The tiny tip on the bottle allowed me to be very precise with placement on the narrow points and they dried to a perfect shimmer. Every now and then take a moment to look at things through fresh eyes- you never know what you'll see!